What do you do with oil that can't be refined or used for commercial purposes? Apparently you tell people that it's great for your health. 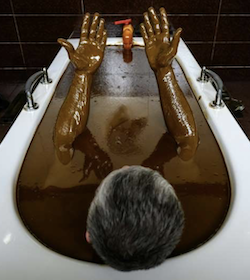 In Azerbaijan's north-western city of Naftalan there is a spa that believes a crude oil bath can cure you of a bunch of things. The local oil is used to treat to cure muscular, skin and bone conditions as well as gynaecological and neurological problems. According to a legend, the healing properties of Naftalan's "miraculous oil" were discovered by accident when a camel left to die near a pool of oil was cured. Essentially you take a naked dip in oil heated to just above body temperature. This lasts for 10 minutes, after which an attendant scrapes the brown oil off your skin and sends you into a shower. Anybody up for an oily road trip? I cant imagine what that smells like. A mechanics dream.